Grants were important documents which recorded land transactions. 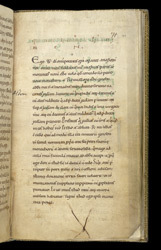 This page has a contemporary copy of a grant made by William I (the Conqueror) to Rywallonus, Abbot of Hyde, of two churches of Southton: Autuna (Alton), with five hides of land, and Clara (Clere-regis), with four hides and one virgate of land in exchange for the site of the abbey cemetery. William wanted to build a palace on the cemetery land. The rudely made cross in the lower margin may be the king's signature.